The International and European Federation of Journalists (IFJ and EFJ) have today condemned the detention of at least 13 international and local journalists by Russian authorities during nationwide anti-corruption protests on 26 March. 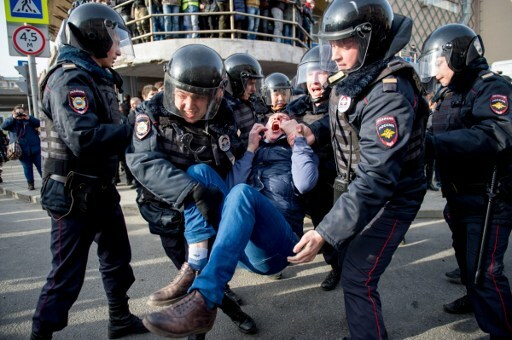 The demonstrations were not officially authorised in many Russian cities including Moscow and Saint-Petersburg which led to the detention of hundreds of people. Six journalists – among them two international correspondents – were detained in the capital Moscow, three in Saint-Petersburg and four more in other Russian cities. Reports added that the police also threatened and hit some reporters to prevent them from covering the demonstrations. Journalist Alec Luhn, working for UK-based The Guardian newspaper, was detained in Moscow and charged with “administrative violation for participating in an unsanctioned rally” even if he repeatedly said he was a journalist, he reported on Twitter. He added that he was released four hours later. Correspondent for Open Russia, Sofiko Arifdzanova, a journalist for RBK, Timofey Dzyadko, and a freelancer Denis Styazhkin were also detained in Moscow while press photographer for Life Vladimir Suvorov reported being threatened by the police to prevent him from filming the protests with the camera. Also in Moscow, near Pushkin Square, two other journalists were detained: Danish journalist Simon Kruse, correspondent in Moscow for the Danish newspaper Berlingske, and Russian journalist Alexander Pluschev, who works for both Deutsche Welle and Ekho Moskvy Russian radio station. In Saint-Petersburg, the correspondent for Vedomosti Nadezda Zaitseva and for Novaya Gazeta in Saint-Petersburg journalist Segrei Satanovskyi were detained and released only after the arrival of deputies Boris Vishnevskyi and Maxim Reznikov from the Petersburg Legislative Assembly, reports said. The police took Satanovskyi’s press card and didn’t give it back to him saying that it was lost. Diana Kachalova, the chief editor of Novaya Gazeta in Saint-Petersburg, said they would file an official complaint. Another detained media employee Artem Aleksandrov from Delovoi Peterburg was released later that night while journalists David Frenkel and Alexander Petrosian from Kommersant were beaten by the police. Petrosian was hit on his arm by a truncheon. In Petrozavodsk city, journalist Alexei Vladimirov working for the local newspaper Chernika was attacked by a policeman while broadcasting live from another protest. According to his employer, the policeman hit the journalist several times and punched him in the face, despite the fact that the journalist presented his press card. Many journalists were also detained in other Russian cities: in Mahachkala, journalists Sergey Rasulov from Kommersant, Faina Kachabekova from Caucasian Policy, Vladimir Sevrinovsy from Eto Kavkaz. In Saratov, journalist Alexander Nikishin from Open Channel TV was also detained. The IFJ and the EFJ backed their affiliate and demanded justice for the detained and beaten colleagues.